Conrad Macao, Cotai Central has announced its ‘Pink Inspired 2015’ campaign. From 1 – 31 October, the hotel will offer its guests a series of ‘plush, pink experiences’ in support of the Hong Kong Cancer Fund’s Pink Revolution, an annual campaign that raises awareness and funds for breast cancer research. 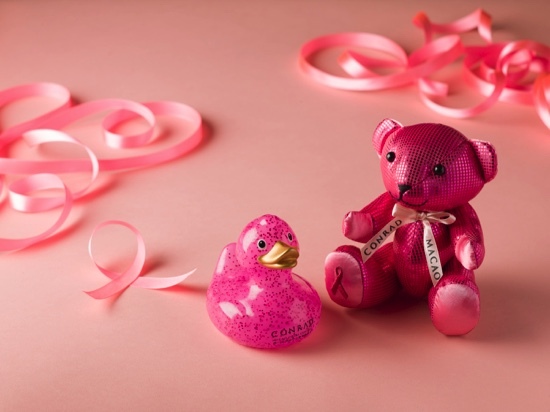 A Diamond sponsor of the campaign for the third year in a row, Conrad Macao has pledged to donate a portion of its sales proceeds to the fund, including proceeds from its limited edition pink bear and rubber duck. The hotel’s ‘Pink Inspired 2015’ campaign will turn the hotel pink, along with all the floral arrangements and decorations inside the hotel. ‘Pink Fridays’ will involve staff and management adding a dash of pink to their uniforms, turning their regular emails and handwritten guest cards pink as well. Creative Macau is set to hold the grand opening ceremony of its “Rich Life” Members Exhibition together with a live music performance to celebrate its 12th Anniversary this Friday. The grand opening ceremony will start at 6pm with a set of live acoustic and electronic music played on a combination of different instruments by local band, Concrete Lotus. Guests and members will be invited to blow out a 12-candle birthday cake to celebrate the project’s forthcoming twelfth year. Lúcia Lemos, Coordinator of Creative Macau thanked the great support and contribution of all local creative communities, organizations, associations and the founder Institute of the European Studies of Macau. “Without their support, we couldn’t have enhanced enthralling and innovative programs to our cocoon. My gratitude to the grateful work for the community,” she added. The “Rich Life” Exhibition aims to showcase diverse perceptions towards the meaning of rich life through various kinds of visual artwork, as a way of evaluating whether the thriving gaming industry impacts the quality of life in Macau. It invites 25 artist members to exhibit, including: Adalberto Tenreiro, António Mil-­Homens, Cristina Dias, Cristina Vinhas, Denis Murrell, Duarte Esmeriz, DWG (Doris, Wilmer, Grace), Franciso Ricarte, Gigi Lee, João Cordeiro, Justin Chiang, Katat Chan, Li Li, Madalena Fonseca, Mel Cheong, Menn Chow, Noah Ng Fong Chao, Raúl Martins, Sofia Bobone, Sofia Lou Sio Fa, Sonia Viseu, Tang Kuok Ho and Wu Lu Sheng. The exhibition will be open to the public free of charge from 28 August to 30 September.